Article 3 of the United Nations Declaration on the Rights of Indigenous Peoples clearly states that Indigenous peoples have the right to self-determination. By virtue of that right they freely determine their political status and freely pursue their economic, social and cultural development. Mazi Nnamdi Kanu, the leader of Indigenous People of Biafra, IPOB, and Director of Radio Biafra/Biafra Television is currently illegally incarcerated in Kuje Prisons because he peacefully demanded for self-determination for his people. He vocally and truthfully spoke on the state of Nigeria, educating and enlightening his people about their origin, the expiration of the amalgamation treaty and the need for the restoration of the sovereign state of Biafra. Nnamdi Kanu used his oratory and without fear for speaking the truth, to galvanize his people to demand for their right to self-determination. He wisely set up a radio and television station wherein he broadcasts to his people all over the world. Without ado about his lovely family, royalty, wealth and British citizenship, he left all in order to awaken his people and putting his own life at risk. On October 14th 2015, he was arrested by Nigeria’s secret security service - Department of State Security (DSS), in his hotel room in Lagos State when he returned from London on his way to Biafra land. Nnamdi Kanu was first arraigned on November 23, 2015 in an Abuja Magistrate Court for charges of “criminal conspiracy, intimidation and membership of an illegal organization”. The magistrate court granted him bail on stringent conditions which was fulfilled, but the DSS refused to release him on bail and still kept him in their custody. In a twist, the DSS changed the charges to “sponsoring and financing terrorism,” and opted for the case to be transferred to the Federal High Court, Abuja. The case of “terrorism” was struck out against him by the High Court Judge and an order for his unconditional release was made. Instead of releasing him as ordered by the court of competent jurisdiction, the DSS rearrested him and awaited the president’s order. 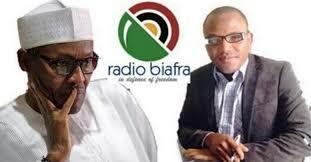 Later, President Muhammadu Buhari in his maiden media chat berated the Judges for their rulings; claiming Nnamdi Kanu had Nigeria and British passports and that he sneaked into the country without check, that he was also in possession of sophisticated broadcasting equipment, and he has no right to talk about Biafra because he was not born during the Biafra Genocide of 1967-1970. Buhari demanded that Nnamdi Kanu must be tried in a court, even when two courts of competent jurisdiction have already made their rulings. Not surprise, the DSS subsequently charged Nnamdi Kanu for “treasonable felony” at the Federal High Court, Abuja. Justice John Tsoho was chosen for the hatchet job, and the judge revealed he has been compromised when he reneged on his earlier ruling of disallowing masked witness. Judge John Tsoho was pressurized by the DSS to make the trial a secret one and allow masked witness which he readily agreed. Nnamdi Kanu, through his lawyers, has filed a case at the ECOWAS court, hoping to get a fair trial. It should be noted that Benjamin Madubugwu and David Nwawuisi are also standing trial as co-accused with Nnamdi Kanu. Is seeking for ones’ right to self-determination an act of treasonable felony? Is dual citizenship not in consent with the Nigeria constitution? Is it a crime for been in possession of broadcasting equipment in Nigeria? How will Nnamdi Kanu pass through airports from London to Lagos without any passport? Is it not in court recordings that the DSS is in the custody of his Nigeria and British passports? If Nnamdi Kanu cannot talk about Biafra because he was not born during the genocide; was Muhammadu Buhari born during the amalgamation of Nigeria to make him very eager to kill Biafrans? The Nigeria Judicial system is on trial, and the world is watching, Shame on so-called human rights activists and advocates that have remained mute while the human right is been raped in Nigeria. The United Nation has conspicuously remained silent when thousands of Biafrans are been killed, injured, disabled and imprisoned illegally, for seeking their inalienable right to self-determination as saliently provided for in the 2007 United Nations Declaration on the Right of Indigenous Peoples. The international community and media have also pretended not to see the intimidation and highhandedness by the Nigeria armed forces against peaceful protesters demanding the release of their leader, Nnamdi Kanu. It is no surprise to witness the conspiratorial silence against Biafrans, the Nigerian government is spending millions of dollars on lobbyists to make sure the issue of Biafra does not come up for open discussion in the United Nations and international media. Annually, on August 9, the United Nations marks International Day of World’s Indigenous People, the day is focused on protecting the rights of the World’s Indigenous population as well as recognizing their cultures and the contributions they make to the global society. It is very obvious the celebration does not concern the indigenous people in Africa but racially inclined for only the indigenous people in the western world. Though the Bishop of Rome, Pope Francis spoke via his Twitter handle saying “We ask for respect for indigenous peoples whose very identity and existence are threatened.” I humbly task the papacy to use its prominent role to speak more boldly and specifically on the plight of the Indigenous People of Biafra whom were largely represented in his weekly Angelus address in St. Peter’s Square, six months ago. I wish to inform the Pope that the leader of those Biafrans he addressed and prayed for, from the balcony of the Apostolic Palace, is still been detained, and thousands of Christians protesting his detention have been shot and killed extra-judiciously by the Nigeria armed forces. The Indigenous People of Biafra, IPOB, have chosen to seek for their right to self-determination in a non-violent way, but they continued to get brutalised and made to look foolish for their peaceful approach. The Nigeria government of Muhammadu Buhari intends to bully Biafrans to a state of silence and force them to remain in the contraption created by Fredrick Lugard. The amalgamation of Nigeria in 1914 was done to solely benefit the British urge for crude oil, and according to the signed treaty, the forced union was to last for only 100 years which has expired. Why must Biafrans be made to continue in a forced union after its expiration without having their input of what they really want? The indigenous peoples’ ancestral lands and environment is being polluted daily by multinational oil companies that pay revenue directly to the government, while the people live in poverty and penury. Nigeria’s official policies have relegated Biafra land to a zero economic wasteland with a near-total absence of maritime commerce beyond the export of crude petroleum products. The marginalisation of Biafrans extends to the government educational institute and parastatals, which has made Biafrans to constantly rely on themselves for the development of their region. Even after the genocide against Biafrans, they tried to reintegrate with their Hausa/Fulani and Yoruba neighbours but are still not accepted, their enterprising nature driving envy into their neighbours. Every religious crisis of Muslims against Christians is specifically targeted at Biafrans. Nigeria is a mere geographical expression that has outlived its creation and must be disintegrated to avoid more bloodshed. The Nigeria government must release Nnamdi Kanu and others from detention because they have not committed any crime. Nnamdi Kanu’s call for self-determination can simply be tested by conducting a referendum supervised by the international community, to ascertain if Biafrans want to remain as Nigerians or not.